Chartmill Value Indicator (CMVI) was authored by Dirk Vandycke in the Stocks and Commodities Magazine, January 2013. The CMVI uses Moving Averages of True Range and the Midpoint price to calculate the adjusted open, high, low and close prices. These adjusted values are displayed as price bars on a separate graph. The Chartmill value indicator (CVI) is a short-term oscillator which denotes overbought and oversold markets. Just as other oscillators such as the RSI or MACD try to define buying and selling zones, so too does the CVI but in a slightly different way. The RSI is a range-bound oscillator which can remain in overbought territory for quite a while if the market is in a strong uptrend. The MACD is a smoothing oscillator, as it uses moving averages to smooth out the noise and suffers from the same lagging issue of moving averages on price charts. The CVI attempts to find value in the stock whereby a trader will buy the stock when price aligns with their notion of value, since perceived value will vary from trader to trader. After all, isn’t that what makes the market? To illustrate this tool, look at the above daily chart of Facebook. The CMVI below the price chart does not appear to have the stickiness of most oscillators which stay overbought in a strong bull market. The RSI is a good example of a range based oscillator. This gives the trader an opportunity to buy in a strong bull market when the CMVI finds support at short term undervaluation, as denoted in the chart with the blue arrows. Similarly, there doesn’t seem to be a lag which is typically associated with moving average based oscillators such as the MACD. The idea is that pricing and fair value align at these undervalued levels. 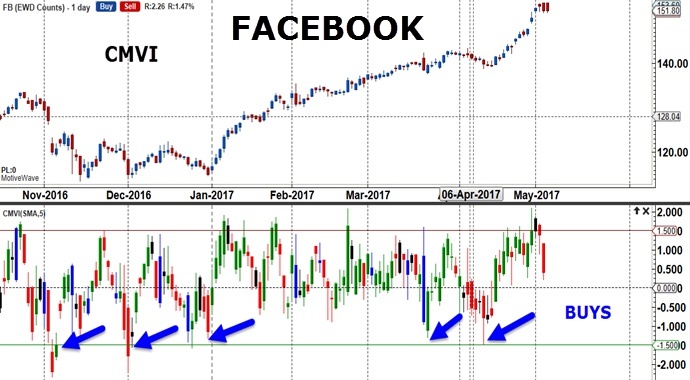 It is otherwise very difficult for a trader to jump in when a stock is rocketing up as Facebook currently is. The CMVI provides a visual for the trader to feel more confident in buying the stock during its upward move. The chart below compares 3 oscillators – the CMVI, RSI and MACD. 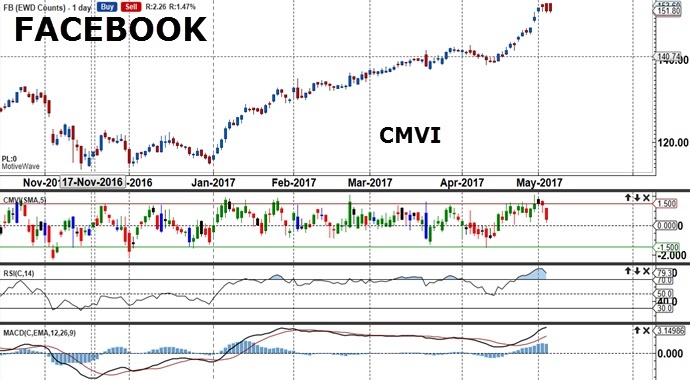 One can readily see the value of using CMVI over the RSI which remains in overbought territory during Facebook’s surge in price. The CMVI gives buy confirmations every time it dips below a certain level. Similarly, this oscillator is quite different from the way the MACD presents as well. The MACD provides buy signals when the MACD line crosses above the signal line but it doesn’t do a whole lot to help a trader buy into the trend once it is entrenched. Timing is money and any method that provides good timing is worth testing and evaluating. Learn how the Chartmill Value Indicator helps keep traders in the trend longer, providing additional entry points while the market is trending. Start incorporating the Chartmill Value Indicator into your chart set-up. Finally, use the Chartmill Value Indicator in developing trading strategies. This entry was posted in Trading Tips and tagged Chartmill Value Indicator, day trading, forex trading system, market analysis, trading, trading strategy, trading system.